As a professional organizer, you probably aren’t surprised to learn that I frequently review organizing resources. I read books, listen to podcasts, read articles, peruse websites, take classes, view webinars, and participate in email and Facebook group discussions. I do this because I want to be the best that I can for my clients, but also because I truly love learning about and talking about organizing. My favorite format is listening to podcasts or audiobooks. I spend a lot of time driving to client’s houses and to meetings, and I love using that time to learn. Sometimes I’m even able to directly pinpoint what I need. For example, if I am on my way to organize a client’s closet, I might listen to my favorite podcast about closet organization. There are so many wonderful resources available. In fact, it can sometimes get a bit overwhelming. More often than not, those who struggle with organization have frequently purchased many books on the topic. Sometimes they read the books and try to put the principles into place, and other times, the books end up contributing to piles of clutter and never get read. Many of these resources are well-written and practically helpful. But not all of them are applicable in every situation. Every organizer has a different style and approach, just as every reader has different perspectives and needs. One book may be perfect for one group of individuals while leaving others uninspired. Just as there is not just one way to organize, there is no one size fits all perfect organizing resource. 1. By the time this book was written, Julie Morgenstern already had many years of experience working with clients. She used this extensive knowledge base in writing the book, and everyone can probably relate to at least one of the stories she shares. 2. This book has stood the test of time. The book was first written in 1998, with the 2nd edition being released in 2004. Organizers around the world have read and reviewed this book, and it is on the National Association of Professional Organizers’ (NAPO) recommended reading list for new organizers. 3. Instead of going directly to the “how to’s” of organizing, the author starts with a thorough discussion of the many different reasons why a person might struggle with organization. These different reasons can lead to different solutions, so figuring out which applies to you is essential. 4. The book is well-written with practical advice and plenty of specific examples of how to implement the principles. However, instead of using a “one size fits all” approach, the author encourages the reader to analyze their individual situation meticulously. This will make it much more likely that their organizing efforts will be effective and maintainable. 5. In the resources section, there is a helpful appendix that can be used when organizing any area of your home or business. There are so many other valuable resources on organizing available, many of them free. If you would like other recommendations, I would be happy to recommend some to you. If you have an organizing challenge you’re struggling with, I’d love to help. Organizing is my favorite discussion topic, so feel free to contact me anytime. 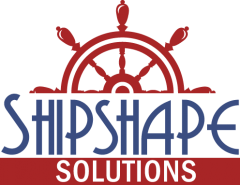 My email address is beshipshape@gmail.com, and my business number is 423-567-4273.